Biologists from the University of Tübingen are part of an interdisciplinary team which has developed novel biosensors that enable pharmaceutical products to be detected more effectively in water. These sensors can measure two types of pharmaceutical substances – beta-blockers and non-steroidal anti-inflammatory drugs (NSAIDs) – in real-time and in low concentrations. The research was recently published in Water Research. In the joint project “EffPharm” biologists, biochemists and analytical chemists are working to find a solution to the problem. The project is funded by the German Environment Agency (UBA) and coordinated by ecotoxicologist Professor Rita Triebskorn. In this context, the working group headed by Dr. Manfred Frey from the Steinbeis Innovation Center for Cell Culture Technology at the Mannheim University of Applied Sciences has succeeded in developing cell-based biosensors for two classes of drugs. These biosensors can detect the binding of such substances to their target molecules (receptors) in treated waste water in real time. At the University of Tübingen, Professor Rita Triebskorn and Professor Heinz Köhler from the Animal Physiological Ecology working group have demonstrated these biosensors to be able to detect very low concentrations of the drugs at levels which are harmful to water organisms. Dr. Marco Scheurer from the Water Technology Center in Karlsruhe showed that the new biosensors capture a large proportion of the compounds that had previously been detected by complex and time-intensive chemical analysis. The newly developed biosensors have many more advantages in contrast to previous approaches. After the biosensor cell lines are exposed to drugs in water samples, a fluorescence signal appears within seconds. 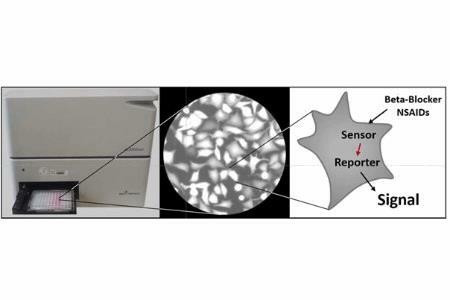 In contrast to conventional reporter gene assays, the biosensors detect the effect of chemicals in the cell in real-time and avoid misleading information which may occur in reporter gene assays that take several hours to generate a signal. Thanks to their mechanism of action, the biosensors can detect future beta-blockers or NSAIDS without knowing their exact chemical structure.